Elizabeth Stride was born Elisabeth Gustafsdotter on November 27, 1843 on a farm called Stora Tumlehed in Torslanda parish, north of Gothenburg, Sweden. She was baptized on December 5 of that year and confirmed in a church in Torslanda. At the time of her death she was 45 years old. She had a pale complexion, light gray eyes and had curly dark brown hair. All the teeth in her lower left jaw were missing and she stood five foot five inches tall. On a Certificate of Change notice filed in Sweden at the time that Liz moved to London it is stated that she could read tolerably well but had little understanding of the Bible or catechism. Lodgers described her as a quiet woman who would do a "good turn for anyone." However she had frequently appeared before the Thames Magistrate Court on charges of being drunk and disorderly, sometimes with obscene language. She made money by sewing and charring, received money from Michael Kidney and was an occasional prostitute. Her father was Gustaf Ericsson and her mother Beatta Carlsdotter. On October 14, 1860 she moved to the parish of Carl Johan in Gothenburg. While there she worked as a domestic for Lars Frederick Olofsson, a workman with 4 children. February 2nd of 1862 finds her moving to Cathedral parish in Gothenburg. In March 1865 she is registered by police as a prostitute and on April 21 of that year she gives birth to a stillborn baby girl. According to the official ledger wherein she is entry number 97, she is living in Philgaten in Ostra Haga, a suburb of Gothenburg in October 1865. During October and November she is treated at the special hospital Kurhuset for venereal disease. The October 17 entry states that she is treated for a venereal chancre. She is reported as healthy in the November 3, 7, 10, 14 entries and after the last entry she is told she will no longer have to report to the police. On February 7th of 1866 she applies to move to the Swedish parish in London, England. She enters the London register as an unmarried woman on July 10, 1866. According to testimony by Charles Preston, who lived at the same lodging house, she came to London in the service of a "foreign gentleman." Michael Kidney, with whom she lived on and off prior to her death, says she told him that she worked for a family in Hyde Park and that she "came to see the country." He also believes that she had family in London. July 10, 1886 -- she is registered as an unmarried woman at the Swedish Church in Prince's Square, St. George in the East. On March 7, 1869 she marries John Stride at the parish church, St. Giles in the Fields. The Service is conducted by Rev. Will Powell and witnessed by Daniel H. Wyatt and N. Taylor. Stride gives her address as 67 Gower Street. Soon after the marriage John and Liz are living in East India Dock road in Poplar. They keep a coffee shop at Chrisp Street, Poplar and in 1870 in Upper North Street, Poplar. They move themselves and the business to 178 Poplar High Street and remain there until the business is taken over by John Dale in 1875. In 1878 the Princess Alice, a saloon steam ship collides with the steamer Bywell Castle in the Thames. There is a loss of 600-700 lives. Liz will claim that her husband and children were killed in this disaster and that her palate was injured by being kicked in the mouth while climbing the mast to escape. No corroborative evidence exists for this statement and we know that her husband actually died in 1884. The post mortem report on her specifically states that there was no damage to either her hard or soft palate. This story may have been told by her to elicit sympathy when asking for financial aid from the Swedish Church. On December 28, 1881 through January 4, 1882 she is treated at the Whitechapel Infirmary for bronchitis. From the Infirmary she moves directly into the Whitechapel Workhouse. From 1882 onwards she lodges on and off at the common lodging house at 32 Flower and Dean Street. As her husband is still alive at this time it is reasonable to assume that the marriage has irrevocably fallen apart. On October 24, 1884, John Stride dies of heart disease. In 1885 she is living with Michael Kidney. They live together for three years although she often leaves him for periods of time to go off on the town. Michael Kidney is a waterside laborer. He is born in 1852 and is 7 years younger than Liz. they live at 35 Devonshire Street, moving to 36 Devonshire Street five months prior to her murder. At the time of the murder Kidney is living at 33 Dorset Street. Their relationship is best described as stormy. He says that she was frequently absent when she was drinking and he even tried, unsuccessfully, to padlock her in (see list of possession at time of death). On May 20 and again on the 23rd of 1886 She receives alms from the Swedish Church. Sven Olsson, Clerk of the Church remembers her as "very poor." She gives her address as Devonshire Street off Commercial Road. On March 21, 1887 she is registered as an inmate at the Poplar Workhouse. In April of 1887 she charges Kidney with assault but then fails to appear at Thames Magistrate Court. In July of 1888 Kidney is sent down for three days charges with being drunk and disorderly and using obscene language. On September 15 and 20 of 1888 she again receives financial assistance from the Swedish Church. Charles Preston, a barber, had lived at 32 Flower and Dean Street for 18 months says that Liz Stride had been arrested one Saturday night for being drunk and disorderly at the Queen's Head Public House on Commercial Street. She was released on bail the following day. During the 20 months prior to her death she appeared 8 times before the Magistrate on similar charges. On Tuesday, September 25, 1888, Michael Kidney sees her for the last time. He expects her to be home when he arrives from work but she is not. Kidney is unconcerned as she has done this often. "It was drink that made her go away," he said. "She always returned without me going after her. I think she liked me better than any other man." Wednesday, September 26 finds her at the lodging house at 32 Flower and Dean Street. She had not been there in the last three months. She tells Catherine Lane that she had words with the man she was living with. Her being at the lodging house is confirmed by none other than Dr. Thomas Barnardo, a doctor who had taken to street preaching and then opened a famous home for destitute boys. Dr. Barnardo had visited the lodging house to get opinions on his scheme 'by which children at all events could be saved at least from the contamination of the common lodging houses and the street.' On entering the kitchen at 32 Flower and Dean he found the women and girls there "...thoroughly frightened." They were discussing the murders. One woman, probably drunk cried bitterly "We're all up to no good, no one cares what becomes of us! Perhaps some of us will be killed next!" On viewing the body, Barnardo will recognize Liz instantly as one of the women in the kitchen. Thursday-Friday, September 27-28. Liz continues to lodge at 32 Flower and Dean Street. According to Elizabeth Tanner, the lodging house deputy, she arrived at the house after a quarrel with Kidney. Kidney will deny this. Saturday-Sunday, September 29-30, 1888. The weather this evening is showery and windy. Elizabeth spends the afternoon cleaning two rooms at the lodging house. For her services she is paid 6d by Elizabeth Tanner. 6:30 PM: Tanner sees her again at the Queen's Head Public House. They drank together and then walked back to the lodging house. 7:00-8:00 PM: She is seen leaving the lodging house by Charles Preston and Catherine Lane. She gives Lane a large piece of green velvet and asks her to hold it for her until she returns. She ask Preston to borrow his clothes brush but he has mislaid it. She then leaves passing by Thomas Bates, watchman at the lodging house who says she looked quite cheerful. Lane will later state that "I know the deceased had 6d when she left, she showed it to me, stating that the deputy had given it to her." 11:00 PM: Two laborers, J. Best and John Gardner were going into the Bricklayer's Arms Public House on Settles street, north of Commercial Road and almost opposite Berner Street. As they went in Stride was leaving with a short man with a dark mustache and sandy eyelashes. The man was wearing a billycock hat, mourning suit and coat. Best says "They had been served in the public house and went out when me and my friends came in. It was raining very fast and they did not appear willing to go out. He was hugging and kissing her, and as he seemed a respectably dressed man, we were rather astonished at the way he was going on at the woman." Stride and her man stood in the doorway for some time hugging and kissing. The workmen tried to get the man to come in for a drink but he refused. They then called to Stride. "That's Leather Apron getting 'round you." The man and Stride moved off towards Commercial Road and Berner Street. "He and the woman went off like a shot soon after eleven." 11:45 PM: William Marshall, a laborer, sees her on Berner Street. He is standing in the doorway of 64 Berner Street on the west side of the street between Fairclough and Boyd Streets. He notices her talking to a man in a short black cutaway coat and sailor's hat outside number 63. They are kissing and carrying on. He hears the man say "You would say anything but your prayers." 12:00 AM: Matthew Packer claims to sell Stride and a man grapes. This is a very dubious piece of evidence. See Sugden's The Complete History of Jack the Ripper for the pros and cons of this story. 12:35 AM: Police Constable William Smith sees Stride with a young man on Berner Street opposite the International Working Men's Educational Club. The man is described as 28 years old, dark coat and hard deerstalker hat. He is carrying a parcel approximately 6 inches high and 18 inches in length. the package is wrapped in newspaper. "Israel Schwartz of 22 Helen Street, Backchurch Lane, stated that at this hour, turning into Berner Street from Commercial Road, and having gotten as far as the gateway where the murder was committed, he saw a man stop and speak to a woman, who was standing in the gateway. He tried to pull the woman into the street, but he turned her round and threw her down on the footway and the woman screamed three times, but not very loudly. On crossing to the opposite side of the street, he saw a second man lighting his pipe. The man who threw the woman down called out, apparently to the man on the opposite side of the road, "Lipski", and then Schwartz walked away, but finding that he was followed by the second man, he ran as far as the railway arch, but the man did not follow so far. Schwartz cannot say whether the two men were together or known to each other. Upon being taken to the mortuary Schwartz identified the body as that of the woman he had seen." The discovery of Elizabeth Stride's body in Dutfield's Yard, from The Pictorial News, 6th October 1888. "It will be observed that allowing for differences of opinion between PC Smith and Schwartz as to the apparent age and height of the man each saw with the woman whose body they both identified, there are serious differences in the description of the dress...so at least it is rendered doubtful that they are describing the same man. If Schwartz is to be believed, and the police report of his statement casts no doubt upon it, it follows that if they are describing different men that the man Schwartz saw is the more probable of the two to be the murderer..."
Schwartz describes the man as about 30 years old, 5' 5" tall with a fresh complexion, dark hair and small brown mustache. He is dressed in an overcoat and an old black felt hat with a wide brim. At the same time, James Brown says he sees Stride with a man as he was going home with his supper down Fairclough Street. She was leaning against the wall talking to a stoutish man about 5' 7" tall in a long black coat that reached to his heels. He has his arm against the wall. Stride is saying "No, not tonight, some other night." 1:00 AM: Louis Diemschutz, a salesman of jewelry, entered Dutfield's Yard driving his cart and pony. Immediately at the entrace, his pony shied and refused to proceed -- Diemschutz suspected something was in the way but could not see since the yard was utterly pitch black. He probed forward with his whip and came into contact with a body, whom he initially believed to be either drunk or asleep. He entered the International Working Men's Educational Club to get some help in rousing the woman, and upon returning to the yard with Isaac Kozebrodsky and Morris Eagle, the three discover that she was dead, her throat cut. It was believed that Diemschutz's arrival frightened the Ripper, causing him to flee before he performed the mutilations. 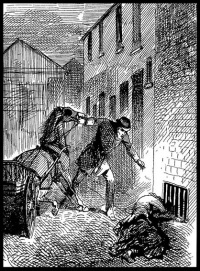 Diemschutz himself stated that he believed the Ripper was still in the yard when he had entered, due to the warm temperature of the body and the continuingly odd behavior of his pony. Dr. Frederick Blackwell of 100 Commercial Road was called; he arrived at 1.16am and pronounced Stride dead at the scene. A two story wooden building, barn like. The club was spacious with a capacity of over two hundred people and contained a stage. Here amateurs performed, mostly in the Russian language, plays by well-known Russian revolutionists. On Saturday and Sunday evenings there would be an international gathering of Russian, Jewish, British, French, Italian, Czech, and Polish radicals. Members thought of the club as the "cradle of Liberty' for the worker's manumission. She is found clutching a packet of Cachous in her hand. Cachous is a pill used by smokers to sweeten their breath. "The body was lying on the near side, with the face turned toward the wall, the head up the yard and the feet toward the street. The left arm was extended and there was a packet of cachous in the left hand. The right arm was over the belly, the back of the hand and wrist had on it clotted blood. The legs were drawn up with the feet close to the wall. The body and face were warm and the hand cold. The legs were quite warm. Deceased had a silk handkerchief round her neck, and it appeared to be slightly torn. I have since ascertained it was cut. This corresponded with the right angle of the jaw. The throat was deeply gashed and there was an abrasion of the skin about one and a half inches in diameter, apparently stained with blood, under her right arm. The Body was fairly nourished. Over both shoulders, especially the right, and under the collarbone and in front of the chest there was a bluish discoloration, which I have watched and have seen on two occasions since. Elizabeth Stride's grave at East London Cemetery. The cut through the tissues on the right side was more superficial, and tailed off to about two inches below the right angle of the jaw. The deep vessels on that side were uninjured. From this is was evident that the hemorrhage was caused through the partial severance of the left carotid artery. Decomposition had commenced in the skin. Dark brown spots were on the anterior surface of the left chin. There was a deformity in the bones of the right leg, which was not straight, but bowed forwards. There was no recent external injury save to the neck. The body being washed more thoroughly I could see some healing sores. The lobe of the left ear was torn as if from the removal or wearing through of an earring, but it was thoroughly healed. On removing the scalp there was no sign of extravasation of blood. The heart was small, the left ventricle firmly contracted, and the right slightly so. There was no clot in the pulmonary artery, but the right ventricle was full of dark clot. The left was firmly contracted as to be absolutely empty. The stomach was large and the mucous membrane only congested. It contained partly digested food, apparently consisting of cheese, potato, and farinaceous powder. All the teeth on the lower left jaw were absent." The day after the murder, a citizen mob formed outside of Berner Street protesting the continuation of the murders and the seemingly slipshod work of the police to catch the Ripper. From here on in, the Ripper is public enemy number one, and Home Office begins to consider offering awards for his capture and arrest. Copy of Elizabeth Stride's death certificate. 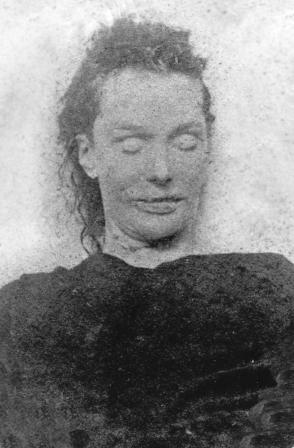 Elizabeth stride was buried on Saturday, 6 October, 1888. 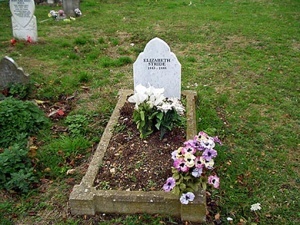 Elizabeth was buried at East London Cemetery Co. Ltd., Plaistow, London, E13. Grave 15509, square 37. The sparse Funeral was paid at the expense of the parish by undertaker, Mr Hawkes.